Forge Word continues to release fantastic additions to the 40k universe! The Spartan Assault Tank is sweet. Do the Space Marines finally get a land based super heavy? Quad Lascannons... Scary! Huge transport capacity... Scary! Model... Scary sweet!!! Forge World is at it again with old marks of Space Marine Armor, they have now added to their lineup a Mark IV Command Set. 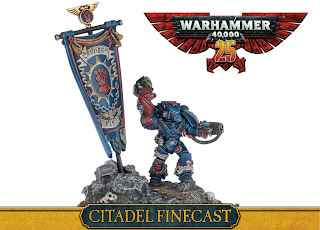 The set has a captain and standard bearer, both of which are outstanding models. 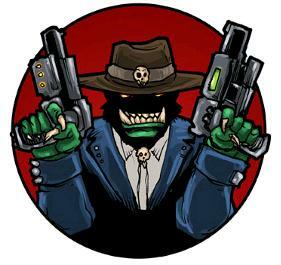 Here is my initial thoughts for an Ork list for the upcoming Cowboy Open. The new age of combat has come 40k is no longer the ground and pound your enemy it is evolving into the pound them from above. 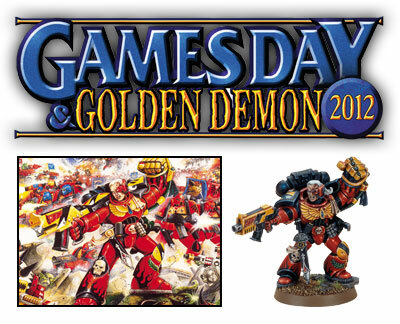 Games Workshop has release 3 new 40k kits due out in June. The Space Marines, Orks and Necrons all have new flyers. Combine this with the storm raven, valkyrie, and the Dark Eldar flyers. 40k has see a dramatic increase of those things not marching along the ground. Also with 6th edition on the horizon the battles won't just be on the table top but well above them. Cowboy Open... the countdown has begun! You may have notice our countdown to the Cowboy Open, and if that has you wondering what the heck that is, let me let you in on the secret. Its the Gladiator and 'Ard Boyz combined into the sweetest 40k tournament ever! Combine that with the fact its at one of our local stores with some of the best 40k players in the country make for a can't miss tournament. Rogue Trader and 2nd Edition 40k, a fun look back into the past. Another fantastic new release by Forge World gives us the Mk IV Space Marine Assualt Squad. I really like the single center engine on their jump packs. I do wish the legs were in more of a running stance. Still a great addition to your Space Marine army. Forge World has come out with a new terminator weapons set. And that got me wondering, considering there're multiple is power weapons in the set is there going to be a change to assault terminators in the new Space Marine codex down the road, only time will tell. They are a rather impressive set one I would enjoy to add to my collection. Adepticon in T minus 2 days!! We are just two days away from Adepticon 2012 and the war drums are being beaten across the country. In just forty-eight hours gamers from all across the country and the world will be converging on Chicago to do battle on the many tabletops that reside within the main hall of the Westin inn. 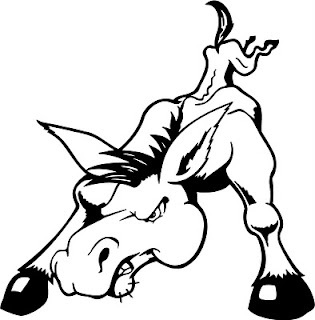 We here at Bad Donkey are no different than the rest of you out there and right now we are oiling up the chain swords, charging up the storm shields and loading our bolters for the biggest bash in the land. We are going in with a smaller number this year, but no less zeal in our hearts. Sure we all want to have plenty of fun, meet all the new friends and reconnect with all of our old friends, but why do we really go to Adepticon? TO WIN! Plain and simple we all go to win. All of have those visions of glory in our heads and we all want to be counted as the best. I say embrace that feeling and go all out, but make sure that you do it in a very sportsman like way. There is no need for getting mad, no place for heated arguments, or room for getting up set. Yes we all want to win but not all of us can win those big games, for one reason or another. Maybe the dice gods left you or maybe that guardsmen pulled off the impossible and killed Abaddon. However, we can all be winners by enjoying the time with like minded peers and throwing down a few while moving some plastic dudesmen. This will be my fifth Adepticon and the tenth anniversary of the event, which looks to be shaping up as the biggest and the best one yet. I cannot promise that I will have videos right away this weekend but look for videos from the con on Monday or Tuesday next week at the latest. I'll let you know how our boys did and how our team placed, along with making sure we get a good look at all of the cool armies out there on the floor for those of you whom cannot make it. I will be taking my Dragon Lords to battle this week and here is hoping for a big finish. Playing for fun and Winning! It's been a while since we have had a good article and I am sorry for that. However, this going to change and I plan on getting out an article every week at very least. To the point today I want to talk about playing for fun and winning. As of late around the blogoshpere as we near Adepticon I have read articles or have viewed battle reports in which some of the more well known 40k personalities have been slowly dusting off the the armies in which the the ap of a boltgun matters to them. I have recently done the same if you guys have been following our battle report page you have seen that I am playing tyranids on a regular basis. As so many have said before me just in the last few months, I'm tired of of the 3+ armies at the moment. I am an avid space wolf player and my Dragon Lords are my pride and joy, but it just gets to a point where you need a break because it's just not as fun. So, enter the tyranids, the second army I picked up of my many 40k armies. Why you ask would you play tyranids and at that a none competive at first glance list. Well the answer is that I find tyranids fun. Yeah, they are underpowered, lack a true you've got to have it unit and if it's not a zoanthrope then you have no invulnerable save, but there is so much more to learn from playing such an army. You learn how to win through synergy. Yes that awful word, I'm now using it because it's true. Playing a codex like tyranids not only teaches you how to win, but it teaches you how to make your army work as a whole. What am I talking about you ask? Well, again it's synergy. Let's take a unit of hormogaunts, in a a recent game against a Purifier spam Grey Knight list I used them to defeat two full squads of purifiers. That would be twenty men. Sounds impossible I know, but hang with me and I will explain the synergy of it. First it starts with my Hive Tyrant taking the skill hive commander, which allows me to take those hormogaunts and out flank them. This saves me from being fired upon by his army. Now, the same power, hive commander, coupled with my lictors allows me to add +2 to my reserve rolls. So, on turn 2 I have to roll a 2+ to bring them in, which is exactly what happened and then I used their fleet roll to get them into assault range. Here is where it gets tricky, how do you defeat the purifiers in hand to hand? It goes something like this, first I move up the tervigon to cast catalyst on the hormogaunts and give them feel no pain. 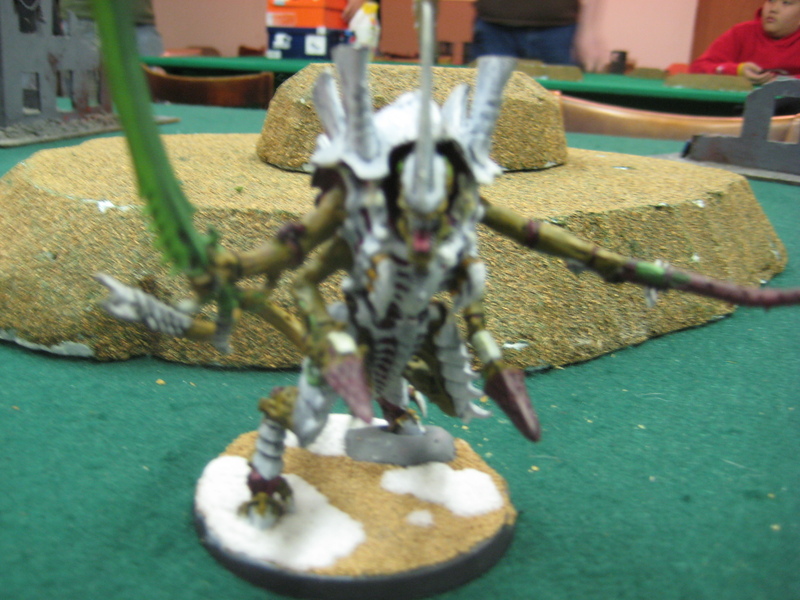 Next I use the hive guard and lictors in my list kill the two nearby psyfleman dreadnaughts. For those whom don't know, lictors have a shooting attack from flesh hooks and you can have the lictors arrive anywhere when they are available. So, right behind on of the dreads, with the rear armor being squishy. Anyway, then the hive tyrant has moved up again and casts paraxsyum on the purifier squad that the hormogaunts are about to charge. Bam ws1 makes these guys not so mean and with the shadow in the warp and feel no pain the cleansing flame is not so bad. For the enevitable counter charge coming from the other squad of purifiers, we use every other gun that I have in the army to whittle them down to a managable number. Then block them form the combat with a throw away unit. Also if the Hive tyrant is close enough, you get that good old adversary working, which I do not run without, yes I know my hive tyrant is almost 300 points. But, for me that is part of the synergy to the tyranid codex. I know this is just one assault and a lot of work to get rid of a unit of purifiers but nothing is easy in the tyranid codex. Now, I won this game through a lot of interesting tactics, but it just goes to show that it doesn't matter what codex you run it's how the general runs the army. The other part is that tyranids are more fun for me than any of my other armies right now, well other than my ogryn heavy guard, but it is so much fun to run something other than a 3+ army and still be able to win. It takes trial and error but playing a "lesser" codex will teach you how to win and you can have fun doing it.